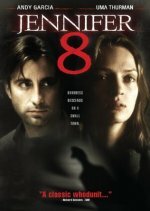 Andy Garcia has the lead role in this hard boiled police drama-mystery. Jennifer 8 was filmed in the time before everyone had a cell phone, the internet boom and all that. The scenery really takes me back. Garcia’s character is John Berlin, a detective who just transferred from the big city to a small town. While investigating a separate case, the police stumble on a human hand. John Berlin takes the case. After digging around, he learns that the victim was blind and he suspects there were other victims who were also blind. He also meets the woman who he believes will be the next victim. I watched this movie last night and I was up until 4:30 AM because I couldn’t bring myself to turn it off and go to bed. It was that good. It’s one of those movies that keeps you on your toes and makes you eager to see what happens next.